The Empress Bulblax (クイーンチャッピー?, lit. : "Queen Chappy") is a boss in Pikmin 2. Its markings and general features are similar to those of the Red Bulborb, but its body is much larger and composed of five distinct segments; its comparatively tiny legs dangle above the ground. In the Piklopedia, this creature sleeps and cannot be woken up. The Empress Bulblax makes a few appearances in the game: it is located on the last sublevel (5) of Hole of Beasts, sublevel 8 of Frontier Cavern, sublevel 11 of Hole of Heroes, and sublevel 4 of Emperor's Realm in Challenge Mode. ↑ In the Hole of Beasts, this enemy has 3300 HP instead. ↑ In the Hole of Beasts, this enemy regenerates 1 HP per second instead. To defeat this enemy, throw (preferably Purple) Pikmin onto its face and call them back before it throws them off. After shaking Pikmin off, the boss rolls from side to side across the chamber in an attempt to crush its aggressors, smashing into walls, and making rocks fall from the ceiling in most encounters in the game. Although risky, the Bulblax can be petrified if the spray is released on the middle of its elongated torso. The Empress Bulblax is one of the few bosses that can vary depending on where the player encounters it: for the Hole of Beasts fight, it is easier to throw the Pikmin on the Empress Bulblax's side to the left and retreat to the alcove in the wall between attacks. Here, it is also effective to swarm the body from the left at the start of the battle, before the boss wakes up. Doing this will deal heavy damage if many Pikmin manage to latch onto the Empress. This is not as effective in the later two battles, as the Pikmin have less time to attack the enemy before it shakes the Pikmin off, and they have the Empress continuously giving birth to Bulborb Larvae. These are easily defeated by their own mother's rolling; alternatively, in the Frontier Cavern, since the number that can exist is finite, they can be lured away from the Empress with one leader while the other fights the boss, resulting in a fight that is about as easy as in the Hole of Beasts. For the Hole of Heroes fight, the player starts off behind the Empress, and it can make boulders fall after hitting the walls; these are most easily avoided by moving behind the exit hole, itself behind a gate. All rules apply here the same as the Frontier Cavern fight, but trapping the larvae is nearly impossible, and requires a decoy leader who is in good condition. When defeated, four of the Empress Bulblax's front body segments explode, leaving only the segment attached to the head, which can be returned to the Research Pod and cashed in for × 15. During the fights with the Bulborb Larvae, it is suggested that a leader should distract the larvae, preferably at full health and with the Metal Suit Z obtained, as the larvae can deal a lot of damage otherwise. The Empress Bulblax appears as a trophy in Super Smash Bros. Brawl. “A member of the grub-dog family, transformed by environmental factors. Due to her ridiculous size, the empress bulblax can no longer walk on her tiny legs. She just wiggles around, rolling from left to right. Although the female continues spawning bulborb larvae, she unfortunately rolls over them with her massive body. The Empress Bulblax makes a cameo appearance in the game WarioWare: Smooth Moves, where the player must tilt the Wii Remote to squish some Pikmin. The Empress Bulblax appears as a Primary Spirit in Super Smash Bros. Ultimate after enhancing a Red Bulborb spirit. The Empress Bulblax is the female counterpart to the Emperor Bulblax, and is indeed a large Bulborb. Its Japanese name is クイーンチャッピー?, which means "Queen Chappy". Its scientific name is Oculus matriarcha, with Oculus being used in the scientific name for all Bulborbs, and matriarcha being similar to the English word "matriarch", which is the female leader of a community. In the unused early English script inside the game's files, the species name is misspelled as matriarhca. Its internal name is simply queen. The Empress Bulblax asleep, in the Piklopedia. E3 2003 screenshot showing the boss being awakened. The boss in the Hole of Beasts. The boss with its army of Bulborb Larvae. A close-up of the boss. The spoils of the boss. The Empress Bulblax may shed its skin; on the last sublevel of the Hole of Beasts, right underneath the Research Pod, there appears to be an Empress Bulblax skin on the floor. It is impossible to wake up the Empress Bulblax in the Piklopedia, no matter how many Pikpik carrots are thrown at it. The only other enemies who will not attack in the Piklopedia are the Titan Dweevil and the Segmented Crawbster. 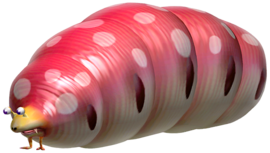 The Empress Bulblax is the only member of the Grub-dog family that does not kill Pikmin by eating them. The creature resembles a real-life pregnant queen termite. The Empress Bulblax gives live birth to its larval-form offspring. This is not only unique to the Pikmin franchise, but also to Earth lifeforms. The Empress Bulblax's specific epithet, matriarcha, indicates that it is considered a different species from its offspring, the Bulborb Larvae (bambinii). How a parent of one species can bare the offspring of another is unknown, so this could actually be a mistake. The Japanese Louie's notes mentions cooking the ovaries of the creature instead of its liver. This was also the case for the prototype version of Pikmin 2's English script. This page was last edited on March 23, 2019, at 17:42.